Welcome to my personal website. I am a Professor at the University of Alicante (English Studies Department) and Honorary Professor at Universidad Ricardo Palma (Lima, Peru). You will find more information about my academic and research activities in this site. 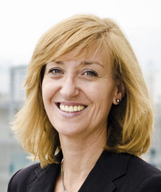 Vargas Sierra, C (2018): "El traductor en el país de las tecnologías. Un viaje al instante presente". IX Jornadas Nacionales de la Federación Argentina de Traductores. Universidad Nacional de Córdoba, Argentina, 4th-6th October 2018. Speaker at "Translating Europe Forum 2016. Focus on translation technologies" presenting the paper entitled: "Bilingual terminology extraction from translation memories: a state-of-the-art overview". Curso de verano en la Universidad Politécnica de Valencia, del 13 al 15 de julio sobre tecnologías de traducción. Su objetivo es hacer confluir las necesidades de los traductores con las funcionalidades de las herramientas y recursos disponibles en el mercado con el fin de comprobar lagunas y asesorar a traductores o futuros usuarios sobre estas herramientas. This volume collects a series of studies of researchers that have in common their interest for terminology, translation and specialized languages, and devoted special attention to new theoretical and applied concepts, some of which are raised by the irruption of ICTs and the social web in the areas mentioned. Noticia en la revista Somos publicada en Lima el 28 de setiembre de 2013. "Profesores fuera de serie". Apasionados de la docencia sin fronteras, elaboran temarios y animaciones didácticas que cuelgan en Internet para compartirlos con estudiantes y profesionales de todo el orbe, llevando a la práctica en sus aulas el uso de los dispositivos electrónicos más actuales para motivar al alumnado en institutos y universidades de la provincia. Instrucciones para el envío de comunicaciones: http://www.congresotraduccion2012.uma.es/contribuciones.html. Department of applied linguistics, Polytechnic University of Valencia. This 8th edition of the days of terminology and translation are focused on the language of the tourism and advertising and the role of the translator activity and the study of this language specialty. This Conference aims to offer the greatest possible coverage to the relationship between the translation and the language of tourism and advertising, combination of language pairs, both by the different points of view, from the study of translation, analysis of discourse, the teaching of languages for specific purposes, and the terminology, all this combined with different enfoquesinvestigadores. These workshops are aimed at professional translators, teachers, students of translation and tourism and technicians of language services. With the collaboration of: Centre for languages of the Polytechnic University of Valencia, Department of English Philology at the University of Valencia and the Valencia Traductors Xarxa. The next RITerm Symposium, to be held at the University of Alicante on 25, 26 and 27 October 2012, will cover eight thematic panels that will address various issues related to theoretical and applied aspects of terminology, translation and ICT. Of particular interest will be those dealing with multiple applications and implications of these disciplines in the context of Web 2.0, also called 'the social web'. That is why we have chosen as the title for this symposium the of "Terminology, Translation and ICT: Social Interaction and Collaborative Work for the Construction and Dissemination of Knowledge". El IUMA organiza las II Jornadas de Transición al Oficio de Traductor e Intérprete en la Universidad de Alicante, 3 de febrero de 2012, con entrada libre y gratuita. The Translator: The full professional, Valencia, 15 and 16 October. A seminar on translation and terminology tools the weekend from 16 to 18 September at UAM. It is taught online by means of the "Virtual Campus" learning platform of the University of Alicante. It is based on theoretical and practical lessons based on its own learning materials, which include both traditional, printed materials (the book El inglés jurídico by Enrique Alcaraz Varó, which will send to all the students), and also electronic materials (study guide with vocabulary exercises and translations with footnotes and translation hints). Seminar on location I will be giving at the Universidad Ricardo Palma from 25 to 27 May. 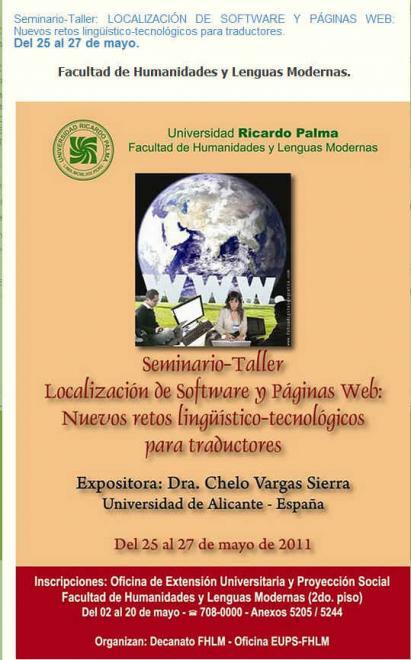 From 28th January to 2nd February 2011 there will be a SDL Trados Studio 2009 course at the University of Alicante. Summer Course: Computer Aided Translation: beginners course on SDL TRADOS STUDIO 2009 (Official certification level 1). See University of Alicante in La Nucia, from 19th to 23rd July, 2010. V Conference on Applied Terminology. I am a translator/a. .. what now?